There is nothing more exciting than embarking on a bathroom remodel. You are finally going to be tearing out what is old and outdated to create a beautiful relaxing interior. You will finally have a bathroom that gives you peace and relaxation after a long hard day. However, some people might be intimidated by the cost. How do you get the bathroom of your dreams without breaking the bank? The natural stone industry is one place to look for ideas that make your champagne wishes come true with a beer budget. Nothing compares to the luxury and beauty of natural stone. Adding granite or travertine will instantly make any space look high end. Your granite vanity top could be anything from the beautiful Brazilian dark green almost black sparkle of Ubatuba Granite to the amazingly elegant gray swirling patterns on the lovely light colored Viscont White Granite. 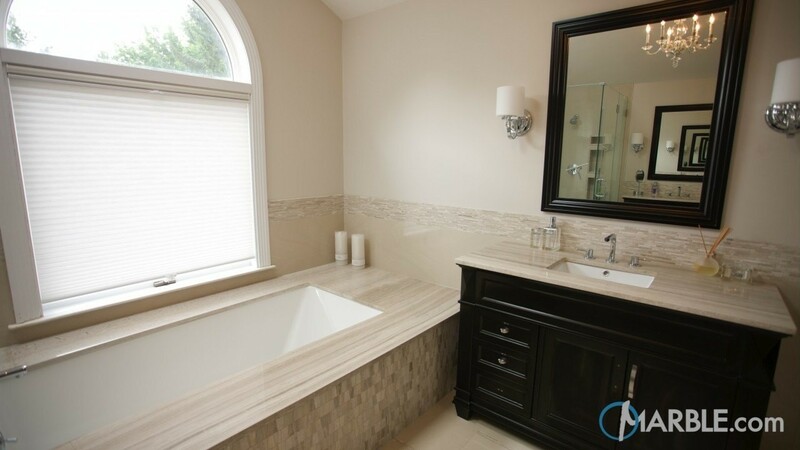 Travertine is another option for adding a high-quality natural stone element in the bathroom. Travertine is perfect for both bathroom and shower surrounds. Do not think that travertine only limits you to beige. Marble.com has an impressive selection of travertine such as Silver travertine that is both elegant and unique. Shown below. One way to save money on your bathroom remodel is to not remove your vanities. Just replacing your vanity tops and repainting the doors will make a world of difference to the look and feel of your space. A vanity top made of Super White Quartzite is a beautiful addition to any bathroom. It has the look and feel of high-end marble, but is considered much more durable and less likely to stain. This quartzite will definitely make your bathroom an extremely luxurious atmosphere. 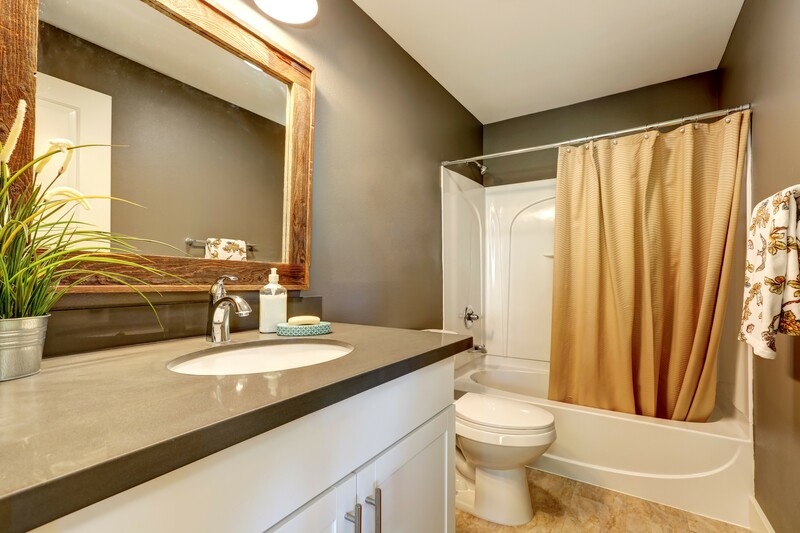 It is important to understand that when budgeting for a bathroom remodel that countertops and surrounds are a great place to invest most of the money. These elements last a lifetime and have the greatest visual impact on your space. Good quality stone can also add to the resale value of your home since any good real estate agent knows that kitchens and bathrooms sell houses. They are experts that will happily advise you on how to make the most of your budget. They can suggest layout options that can also make a monetary difference. Also, they have an endless selection of slabs to choose from in their slab yard. They have many slabs come in from containers from the best quarries in the world. You can choose what fits your style theme and expense account. Natural stone is a great way to make your bathroom feel expensive on even the strictest budget, and they will be happy to help you transform your boring bathroom to an amazing sanctuary that you will enjoy for a great many years.